Photo : Gurney Drive, Penang. Taken on the morning of 15th July 2018. How to Manage Your Condo Without Killing Anyone! Managing a condominium is one of the toughest things to do. 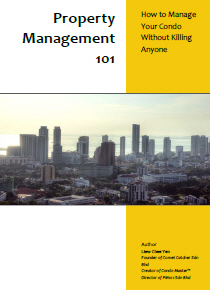 This book contains back-to-basics principles that are typically not discussed by anyone else, but would be important for any building manager or committee member to know. Storing data on paper or spreadsheets is tedious, inaccurate and could be too easily accessed by unauthorized persons. Condo Master helps you keep only one master copy that is accessible only by the right people. Property management means dealing with non-stop issues daily. Condo Master helps you to stay on top of things as a team, and keep residents happy that their issues are being resolved quickly and effectively. Money is usually a hot topic in property management and residents constantly demand more transparency and more accountability. 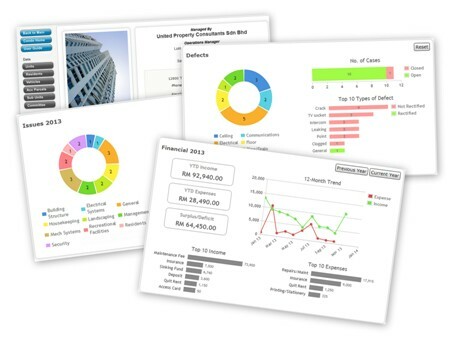 Condo Master helps you to gain better insight on how the money is being spent. Pretty charts makes it all very easy to understand. Accessory Parcels, Car Parks, etc. We are an internet software company based in Penang, incorporated in 2012, with a vision to provide the local Property Management industry with game-changing technology platform at an affordable price. Our company has been awarded the "MSC Status Company" by the Malaysia Digital Economy Corporation (MDEC) on 20 Sep 2016.